What about the links between Genesis 1 and 2? Where was the Garden of Eden and how is it related to Genesis 1? Brief summary: Sailhamer argues that we should read Genesis 1 in terms of its connections to Genesis 2. By reading these together we can identify the “land” in Genesis 1 as the Garden of Eden in Genesis 2. Since the first verse of Genesis 1 is not limited to the “land” but rather the whole universe the writer then focuses on the “promised land” in the verses that follow. To say that the creation account focuses on the Promised Land doesn’t mean that it lacks universal implications. God’s concern has always been for the whole world but the message of God’s work of redemption is centered in His work in the Promised Land. Genesis 1 and the Garden of Eden: At face value or reading “literally” it appears that Genesis 1 and the story of the Garden of Eden creation accounts are contradictory. For example animals are created before man in Genesis 1 but after man in Genesis 2. We must realize though that the author must have been well aware of the differences between the accounts and did not see them as contradictory. To the author the ordering and wording made complete sense and our challenge is to see the passages as the author did. We can only see this by examining the overall meaning of the two chapters. Quoting now from Sailhamer (pg 89). The author of Genesis and the Pentateuch expected his readers to understand his work as a unit. By attaching these two different and distinct accounts of creation in Genesis 1 and 2, he expected his readers to see a meaningful link between them. God’s creation of the man and woman in Genesis 2 was intended to give the reader another view of God’s creation of humanity in Genesis 1. The narrative events in Genesis were to be understood by the reader as a broader perspective on the events of Genesis 1. The differences between the two accounts were precisely what the author wanted his readers to be aware of. Those differences broaden our understanding of the narrative events. If, then, we are to understand Genesis 1 within the context of the whole of the Pentateuch, we must say something about its relationship to the account of God’s preparation of the Garden of Eden in Genesis 2. What does the story of God’s preparing of Eden tell us about the events in Genesis 1? Just how far should we take that connection? Just how much of the story of Genesis 2 are we to read back into our understanding of Genesis 1? The relationship between Genesis1 and 2 follows a common pattern seen throughout the further narratives of the primeval history (Genesis 1-11). The author often links two distinct narratives to reflect a specific textual strategy. For example, after a narrative with a general description of an event, the author often attaches on which gives more detail about the same event. Having described the dispersion of the nations “according to their languages and countries” in Genesis 10, the author attaches the story of the origin of their different languages. In a similar way, in Genesis 1 we are given a general description of God’s work of creation. In Genesis 2 we see a “close-up” of certain aspects of the account in genesis 1. We see, in fact, the preparation of the Garden of Eden and the creation of the man and woman in that garden. There are important implications of such narrative links. 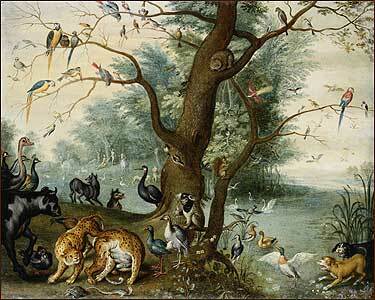 One particular linkage deserves special consideration — the identification of the “land” and the Garden of Eden. The link between Genesis 1 and 2 casts considerable light on the author’s purpose in these creation accounts. If chapters 1 and 2 recount the same event, then the “land” where the Garden of Eden is located in chapter 2 is identified with the “land” which God makes in chapter 1. Moreover if the “land” where the Garden of Eden is located is the promised land of the patriarchal narratives, then the focus of the creation account is that same “land.” If I am right, then Genesis 1 is an account of God’s preparation of the Promised Land. One can easily see how a later writer such as Jeremiah would have drawn the conclusion that Genesis 1 was specifically about God’s preparation of the promised land (see Jeremiah 27:5). “However, the viewpoint of the writer shifts considerably in the second verse. IN the rest of Genesis 1 and 2, the writer is no longer focuses on God’s creation of the universe but on the Promised Land, Israel’s homeland. As he writes the whole of this account, the author wants us to think both about God’s creation of the universe and about the Promised Land. The writer wants us to see god as both the Creator of the universe and the One who prepares a land for His people. That is one of the central themes of the Pentateuch. If we keep that perspective in mind, we will see a surprising and remarkable picture of creation unfold form the narrative of Genesis 1 and 2. We will see a remarkable picture of the Creator emerge, as well. In the early chapters of the Bible, we do not find a distant, detached Creator at work on far-flung worlds….. We find Him as a loving Father, carefully and thoughtfully preparing a specific place for His children to dwell. He creates a world for them and then prepares a place, a homeland, for them in His world. Thus the Pentateuch teaches that when Israel was promised a land in which to live out God’s blessings (Genesis 15:18), it was not the first time God had prepared a place for them. From the beginning, God had prepared that place for His chosen people. From the beginning, God had prepared that place for His chosen people. When He took it away from the Canaanites and gave it to His people, He did so because they had abused their right to live in His land (Genesis 15:16). In the same way, if the Israelites were to abuse their right to live in God’s land, He would also take the land away from them and give it to another (Jeremiah 27:1-6). The land was God’s gift. It was His land; He created it, and He could give it to whomever He pleased (Jeremiah 27:5). The concept of the “land” thus dominates the whole of the theology of the Pentateuch. The early narratives of Genesis already prepare the reader for God’s great promise to the fathers, the gift of the Promised Land. In focusing on the “land”, I don’t mean that God didn’t create the rest of the earth or that the biblical writer was unconcerned about the rest of the earth. On the contrary, one of the central points of the Genesis creation account is God’s concern for the whole world shown by the blessing that will come to this “land.” The “land” is the stage for God’s plan of blessing. In this very land God will bless not only His own people, Israel, but all the nations of the earth. It is already clear within the Pentateuch that the messianic King will one day come to this land. He will arise from the tribe of Judah (Genesis 29:8-12) and establish His kingdom in his land (Numbers 24:5-9, 16-24). He, like Melchizedek, the king of Jerusalem, will bless Abraham and his seed in this land (Genesis 14:18-20), and through Him, all the families of the earth will be blessed (Genesis 12:3). The fact that the account of creation focuses on the Promised Land in no way limits its universal scope. It only limits its perspective, and to understand it correctly we must read it from that perspective.